the sweetest thing...: ONE Day Until the MFT February Release! ONE Day Until the MFT February Release! Hello! It's time for the My Favorite Things February Release Countdown and we have a FULL week of fantastic new stamps and Die-namics to show you. AND we have some fun prizes for you too, so be sure to hop on over to the MFT Blog to see how you can win some MFT goodies this week. All of these new products will be available for purchase on February 11th @ 10 PM Eastern. 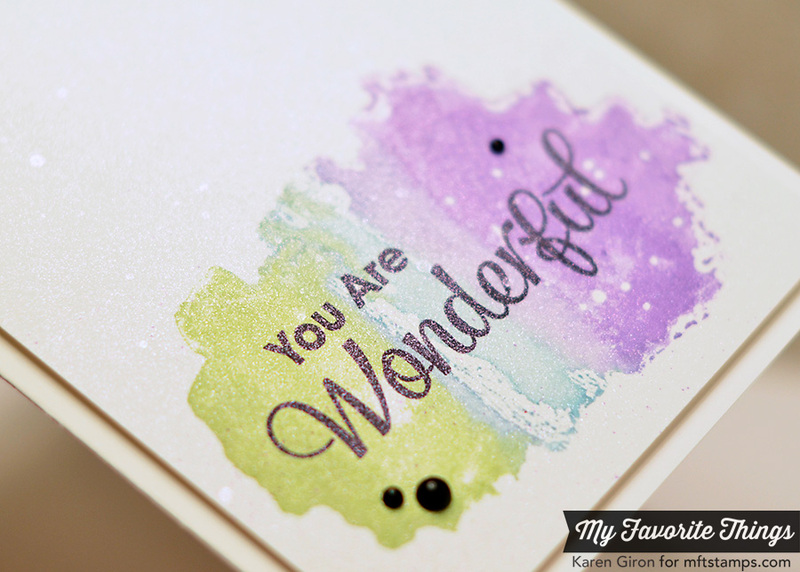 Tonight I have a little sneak for you using a stamp from Watercolor Backdrops. I experimented with this one, so I hope you like the outcome. My card base is Smooth White Card Stock and I grabbed my Sour Apple, Berrylicious, and Grape Jelly Ink Refills for this image. I put a drop of the refill ink in the lid of the corresponding ink pad color and used a slightly wet paintbrush to paint the ink onto the stamp. This allowed me to blend the colors together and overlap them a bit. After the ink dried completely, I stamped a sentiment from Simply Fabulous Sayings in Black Licorice Ink and then added some MIX-ables Sheer Shimmer Mist over the top of that panel. GASP!! This is the first time I've used it and I'm mad at myself for not using it before! YUM-OH! You can sort of see the shimmer in this photo - it's difficult to photograph. Be sure to stop by the MFT Blog for a complete list of designers playing along in today's countdown AND find out how you can win some MFT goodies! Here are the MFT products I used today - all of the new products will be available for purchase on February 11th at 10 PM Eastern. I love this Karen!!! Fantastic colours! Beautiful card and color choice! oooo! like it? I love it!!! this is fabulous, karen. This is gorgeous Karen! 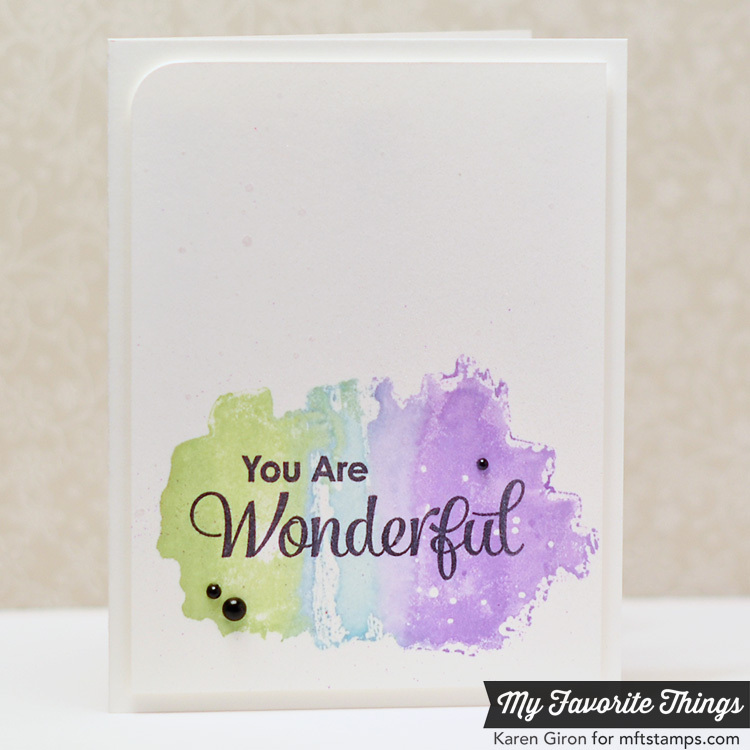 I really love the effect of the painted ink on the watercolor stamp! Awesome card. Love how the colors blended and the spray added white spots to the mix. That shimmer is awesome, great look! Love, love, love this one! The colors are just awesome! A real winner! TWO Days Until the MFT February Release! THREE Days Until the MFT February Release! FOUR Days Until the MFT February Release! FIVE Days Until the MFT February Release! SIX Days Until the MFT February Release! SEVEN Days Until the MFT February Release!